Tucked away on the iPhone 2.0 version of Apple’s Application Store is a counter for the number of times that each application has been purchased . When this information is combined with an application’s price, and the uniform 30% that Apple pockets on each download, it is possible to know how much Apple is making from the App Store. As of 4PM (PST), that number hovers around $55,000. This is pretty incredible given that the iPhone 2.0 software is not officially available and App Store does not officially open till tomorrow, that bloggers have only been able to access the Apps Store for less than 18 hours, and that the 3G iPhone, with the App store built in out of the box, is not even on sale yet in the United States. 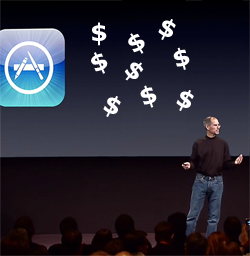 If sales of applications stay at the current pace, which they won’t, because they are going to speed up dramatically, the Application Store would still provide Apple with an additional twenty million dollars of revenue per year. Embedded in the post is a simple revenue model for the App Store, using the fifty most popular applications. We will update this regularly, hopefully including all of the 100 most popular Apps, so stay posted for more data points and more revenue models. That is, unless Apple disables the counter in order to stymie bloggers and stock analysts eager to know how much incremental income Apple is going to make from selling Applications in the App Store. A few notes on the data are necessary. I stopped updating the data at 4PM (PST), but it was affected by sales that occurred over the ten or so minutes that I spent collecting the data. Also, Apple’s counter has some bugs. In the Application Store, the number of sales does not always correspond to an Application’s position on the Top-50 list. My list is a correct ranking based strictly on the number of downloads. And, while collecting the data I noticed that sometimes the counter would go down, something that makes no sense in an Application download store. However, this is still the best and most accurate data we have on the impact of the Application Store on Apple’s bottom line.